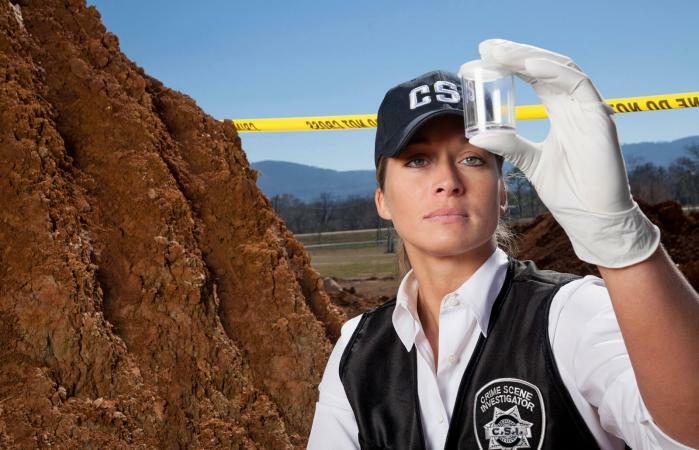 Working as a crime scene investigator involves gathering and preserving evidence at crime scenes. Reviewing a sample job description can be helpful whether you're responsible for writing new job descriptions or if you want to learn more about what's involved in this type of career. There is a lot more to working as a crime scene investigator than just looking for clues and finding traces of evidence left behind by perpetrators. Learn more about common requirements for this type of job by reviewing the sample job description provided here. Simply click the image to access the sample job description document. The sample job description will open as a PDF file that you can review, edit, save and print. Once the file is open, use the file menu to access print and save commands. To edit text, simply click in the row where you'd like to make changes. 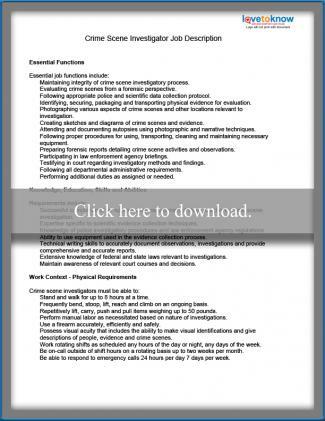 Click to download a CSI job description example. Keep in mind that specific duties and requirements will likely vary somewhat from one law enforcement agency to another. If you are writing a job description, you may want to use this example document as a starting point. However, be sure to adjust as needed to accurately reflect your organization's exact needs and expectations. Job seekers should verify employer-specific requirements when applying for opportunities.